Polishes and protects silver with an invisible wax-like surface that actually slows the formation of tarnish. Perfect for silver on display or in storage. Polishes silver and protects with an invisible wax-like surface that slows the formation of tarnish. Excellent for silver on display or in storage. 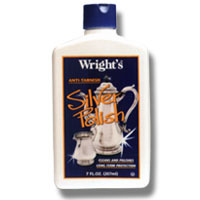 Use Wright's Anti-Tarnish Silver Polish for displayed or stored silver.